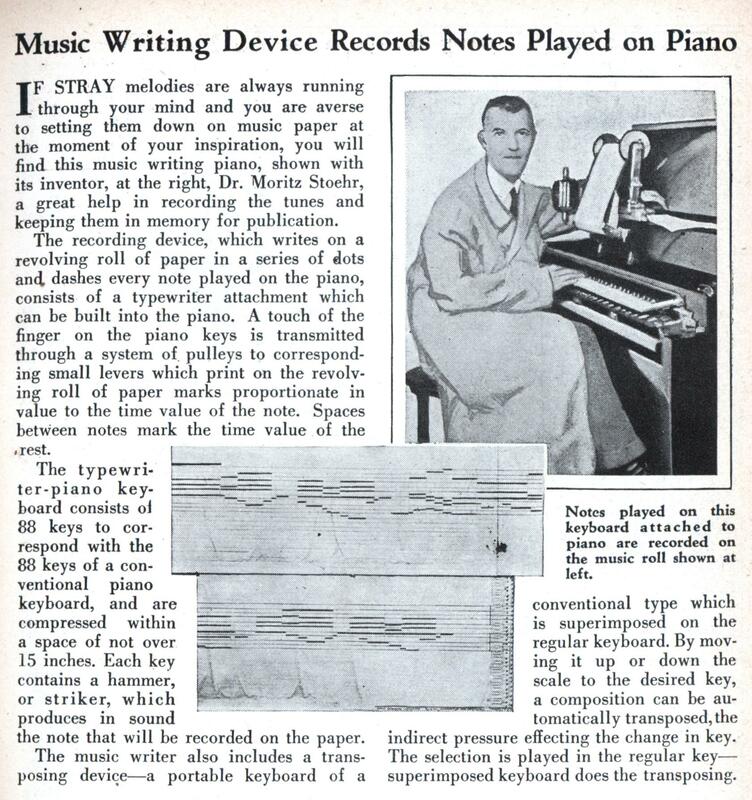 The recording device, which writes on a revolving roll of paper in a series of dots and dashes every note played on the piano, consists of a typewriter attachment which can be built into the piano. A touch of the finger on the piano keys is transmitted through a system of pulleys to corresponding small levers which print on the revolving roll of paper marks proportionate in value to the time value of the note. Spaces between notes mark the time value of the rest. The typewriter-piano keyboard consists of 88 keys to correspond with the 88 keys of a conventional piano keyboard, and are compressed within a space of not over 15 inches. Each key contains a hammer, or striker, which produces in sound the note that will be recorded on the paper. 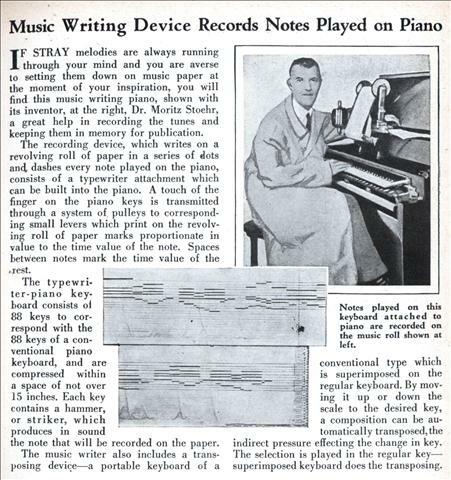 The music writer also includes a transposing device—a portable keyboard of a conventional type which is superimposed on the regular keyboard. By moving it up or down the scale to the desired key, a composition can be automatically transposed, the indirect pressure effecting the change in key. The selection is played in the regular key— superimposed keyboard does the transposing. Just another example of a punched paper medium that was in common use before the advent of more modern media. Pretty amazing. It even looks like a Cubase MIDI track. Check out the CD ‘Gershwin plays Gershwin’. Piano rolls were optically scanned, converted into MIDI files, played on a grand piano in a recording studio, and made into a CD. Theoretically it could have gone from paper to plastic directly. @Jayessell, some of those player pianos — and the rolls for them — are still in good enough condition to play directly. there were models that even recorded the force the keys were pressed with, and would reproduce the volume of the notes that way. i’ve heard Gershwin playing Gershwin on just such a piano, in an old musical instruments museum; it was an impressive, eerie experience, quite beyond what any CD can reproduce, because the self-playing piano was right there. almost as if one was listening to Gershwin’s ghost at the keys. @Nomen Nescio: Not only that, but there were a few models of player pianos that had additional “tracks” to allow the piano to make primitive if-then “jumps”; yep, that’s right – player pianos were -almost- Turing Complete (well, in reality far from Turing Complete – but conditional and non-conditional jumps are needed to get there). The illustration is very strange. Does anyone else think it looks like a photo of the guy’s head has been cut and pasted onto a drawing? Interesting technology, but I can’t stop looking at his outfit. Do you need to wear an oversized lab coat and a tie to play one of these things? @Andrew You’d also need a substantial amount of paper to make them truly Turing-complete. 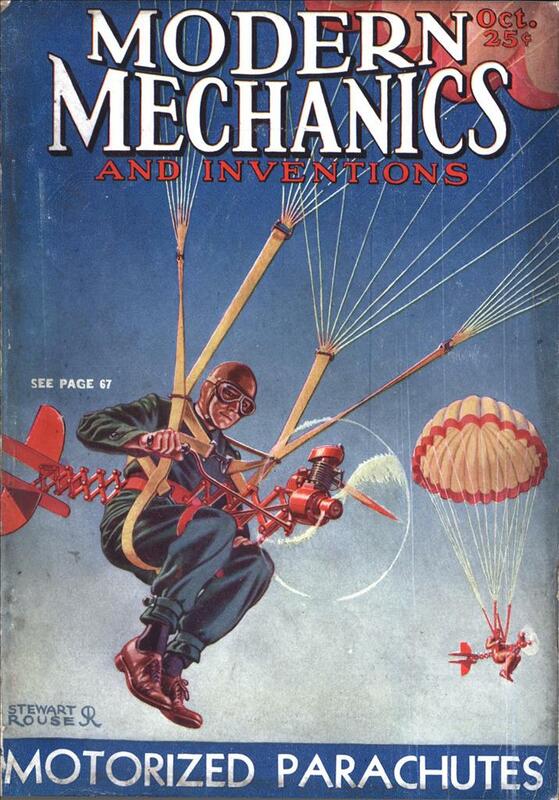 Rather steampunk, I’d say. The intricacy of pre-electronic machines like this is amazing. I’m still impressed by the ingenuity of the player piano. Absolutely. My friend has a player piano and large(ish) collection of rolls. It is operated by a vacuum motor. He did not rebuild the foot-pedal vacuum pump (using an electrical one instead, in a box to keep it quiet), but he rebuilt the rest. Indeed, (if i recall correctly) when the punch through the paper is a little narrower, the suction is less and the key is hit more softly. At any rate, there is definitely a mechanism to do this. Tempo is adjusted by a lever until it sounds right. Some of those rolls are pretty entertaining. Quite a few have the words written on them, encouraging sing-alongs. He also has a hand-crank Victrola and some 78s. A few years ago, when the power went out over a lot of town, I was over there and neighbors kept asking him how he had power — they were just sitting around in the dark waiting for the power to come up. Instead, he pulled out candles, cranked up the Victrola and had a party! The neighbors saw this fully lit house with music blasting out and just assumed 8-). Some composers around the turn of the last century wrote compositions specifically for player piano with chords that no normal human hand can play; they are played today in four-hand transcriptions.